Since 1975, Saturday Night Live has been one of the most popular television series to have graced NBC. The late night sketch comedy has definitely been through its share of ups and downs and the one person who experienced it all is, of course, SNL founder Lorne Michaels. 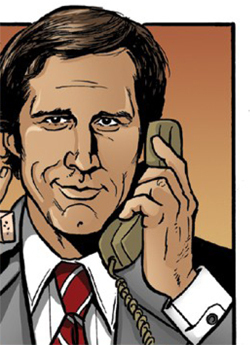 It seems inevitable that Michaels would someday share his story about the history of SNL, but it definitely was not expected that it’d be through a comic book. Bluewater Productions, a smaller comics publisher known for their licensed non-fiction work, has taken on the difficult task of making television’s longest-running show into a comic book. Among Bluewater’s biography series is a title called COMICS, which describes the stories of comedians, sitcoms stars, and stand-ups who have made their mark in pop-culture. 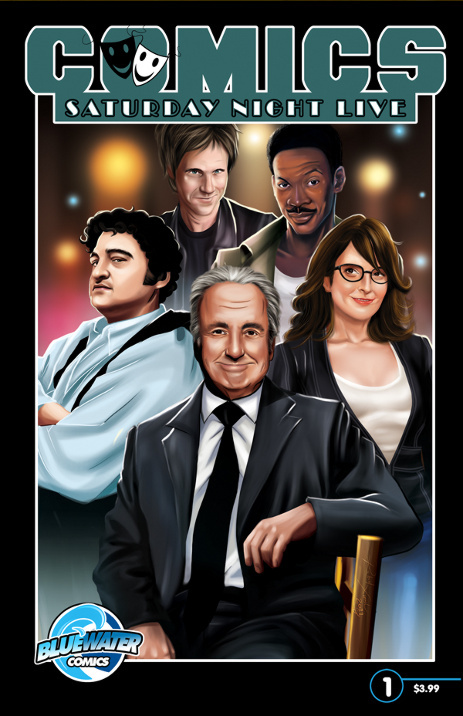 “COMICS: Saturday Night Live”, is written by Chad Lambert (Return to Point Pleasant) with Patricio Carbajal providing the impressive photo-likeness illustrations. Even though I’m a dedicated SNL fan, I assumed a comic focusing solely on the history of the show would be a bit dull, however, Bluewater made feel guilty for ever thinking such blasphemy. The comic is framed by Lorne Michaels preparing himself before an interview regarding SNL, with only four minutes to describe the show and its impact on television. Tough. Michaels reminisces through the creation of the show, the various casts, the downfalls, fears of cancellation, and realization that he basically has the coolest job in New York City. While reading the book, I went through a nostalgic journey of all the sketches I can to quote word for word and the numerous cast members who made a name for themselves. Being an SNL fangirl, I truly enjoyed the informational narration of the comic. It was a simple plot that allowed readers to relate to the producer, writer, and comedian that is Lorne Michaels, which is a quality that only comics can truly master. Although there are some cast members and sketches that I wish the book spent more time on, Lambert covers an astounding amount of information in a short span and does it in a fun, easy to follow way. Unfortunately, if someone without a fair amount of SNL knowledge picks up this issue, the references may come off as nothing more than inside jokes and feel a little off-putting. 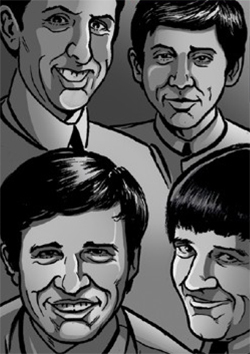 The comic assumes that the reader is aware of all the famous skits and the various cast members. Some cursory knowledge of the original cast, the 90s cast, and the early 2000s cast is required, or the book will make little to no sense. So, if you enjoy Wayne’s World, Turd Ferguson, Shweddy Balls, Buckwheat Sings, and the unforgettable Chippendale’s Auditions, this is a fantastic biography of the show and offers some cool behind-the-scenes insights. However, if you’ve been deprived of SNL – not so much. But it’s not too late to catch up on the past and present! Wide selections of SNL skits are available at NBC’s website, including videos from the 70s to the most current SNL episodes. “COMICS: Saturday Night Live” will be released this month and you can preorder it on Amazon . 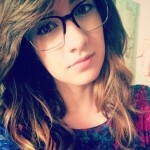 A lover of all things nerdy, Sophie is generally found perusing comic book shops or googling the nearest donut spots. Impassioned Star Wars conversations, nostalgic retro gaming, and discussing old-school hip hop as if it was fine wine are some of her favorite things. It's bring your own instrument day on Derpy Show! Flame On :: Episode 213 :: What’s Weirder Than Weird? Us!